We are only a couple of weeks away from the official start of Summer. I am super excited to bask in the warm weather. Here in NYC we experienced a long winter and a weird spring. Honestly, I don’t even think we had a real spring. It has been cold and rainy. Nevertheless, the weather has been better here and I am ready to hit the streets in all these cute summer dresses that I have piling up in my closet. 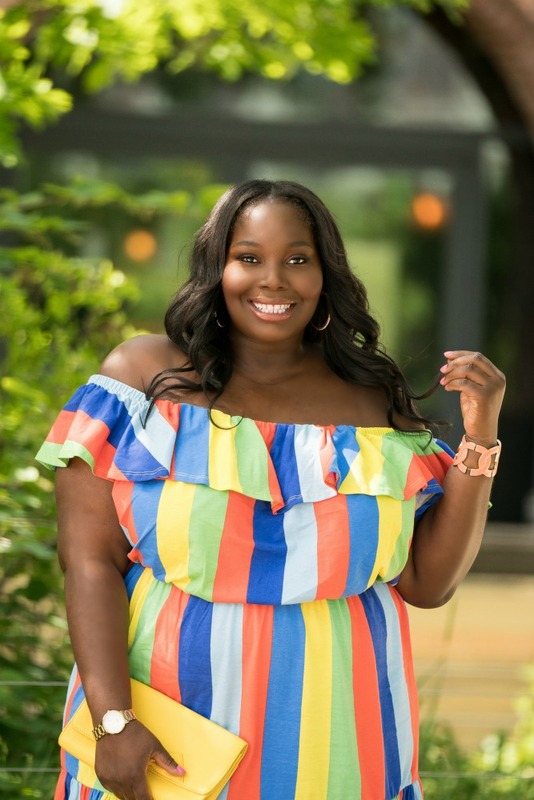 Last month, we did a roundup of some of our favorite ASOS Curve Design pieces. 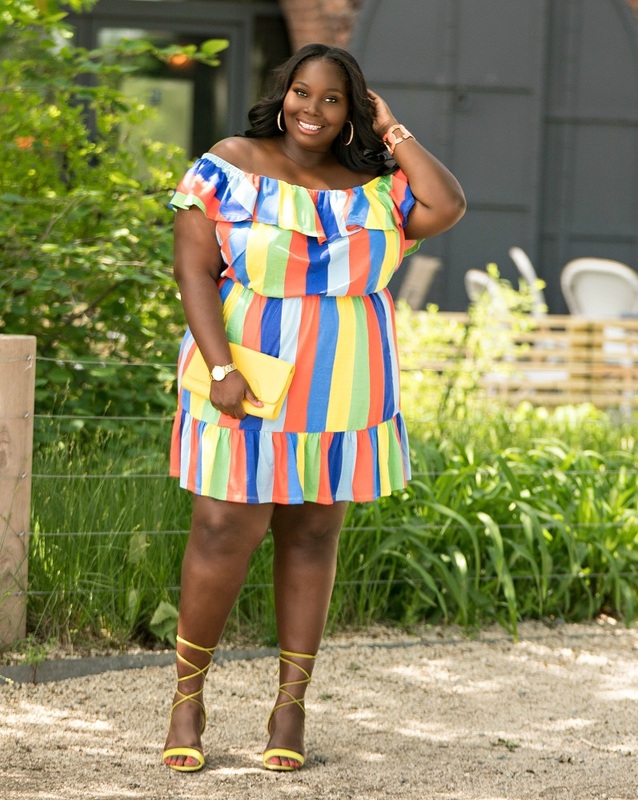 There was a rainbow stripe off the shoulder dress that I was eyeing and I wound up ordering it. I was immediately drawn to the bright colors. Also, the off the shoulder ruffled details really sold me on it. Also, the fact that it was only $29 made me immediately checkout. LOL. Its one of those summer dresses that is girly and fun. You can slip heels or flats with it. Rainbow stripes are a huge trend this season. As you can see, I’m here for them. Now, I have to be honest. This dress is a little too short for my liking but I feel like the ruffles help it out. Also, I should have gotten my regular size. I sized up because it was too short and I was hoping if I got a larger size I would get atleast another two inches in length on it. I got about one extra inch in length. However, the top part was too big. So, if you’re thinking about getting it yourself, GET YOUR NORMAL SIZE. When I wore it, I wanted to play around with some of the bight colors in the dress. I wore a yellow bow detailed clutch to pick up the yellow stripe in the dress. Also, I whipped out my lime green lace up sandals to pick up the lime green color in the dress. Everything worked perfectly together. I would also rock this look with a pair of sneakers just to make it more casual. If you haven’t I suggest you guys checkout some of the ASOS Curve Design pieces because they’re bomb. I read this article and found it very interesting, thought it might be something for you. 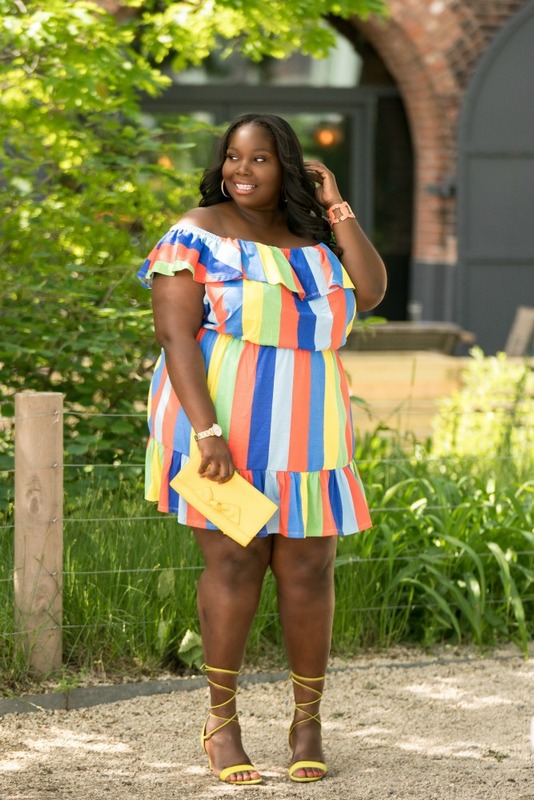 The article is called Kicking Off Summer Style With Rainbow Stripes From ASOS Curve and is located at https://stylishcurves.com/kicking-off-summer-style-with-rainbow-stripes-from-asos-curve/.